This photo was taken at Moon Beach, far from the Yaeyama Islands. The story comes from Ishigaki and a place called Nohara Village. On moonlight nights youngsters would sing and dance at a beach. From out at sea, music and singing could sometimes be heard. An old man fishing with nets was surprised by his extraordinary catch one night. One toss of the nets, gave him an unusually heavy load to haul ashore. When he raised his torch to see what was caught in the nets, he spotted this beauty. She cried, begging the fisherman to release her. To the man, she looked like a young maiden but, she explained, she was a mermaid. The gal had to be released to live in the sea. She had come to warn the villagers of Nohara about a tragedy about to happen. The fisherman untangled her from the nets and promised to let her return to the ocean. But, he wanted her to tell him about what terrible event was about to occur in the village. A tsunami would hit the island, the next day and, destroy everything, she told him. She warned him to go to the mountains before morning. The fisherman released her and, she swam away, singing once again. The villagers were warned and, went to the mountains. They dispatched someone to warn the people in the adjacent village. The villagers in the next town, didn't believe the tsunami story and refused to evacuate. The next morning, from the mountaintops, the villagers of Nohara watched. The waves, reached high into he skies and, ripped the villages from the island. People from Nohara lost their homes but, their lives were saved. 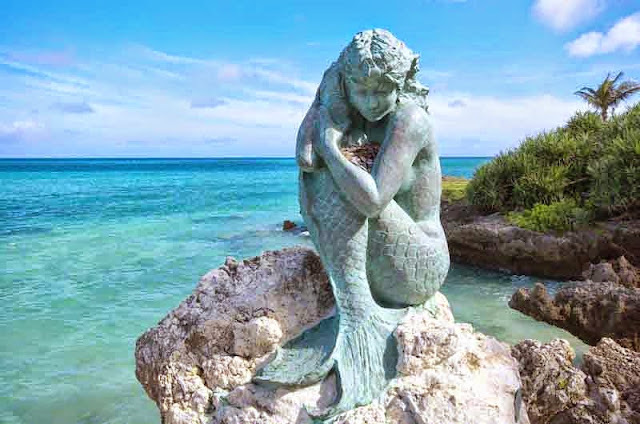 Those who didn't believe the mermaid's story were washed out to sea with their homes. killed a total of 12,000 people. at Ishigaki Island during the seventeenth through nineteenth centuries." Muza-chan, It certainly made an impression on me. If ever, I see a mermaid, I'll get real close so, I don't miss a word she says !